What Size Area Rug Do I Need? Do I need a Rug Pad? YES. A felt rug pad adds body and protects your floor. Felt rug pads are suitable for larger rugs. Non-slip rug pads should be used under smaller rugs to keep your rugs from moving. Non-slip pads add safety. A Rug Pad feels better. You have a rug because you like something soft on the floor. A rug pad is a small investment in your increased comfort. Not only do pads add softness, they also reduce fatigue. Hard floors can be tiring. A Rug Pad is easier on your joints. And they reduce noise. Small area rugs are especially prone to sliding. A non-slip rug pad can greatly reduce the likelihood of an injury from a sliding rug. A Rug Pad will prolong the life of your rug. Rug Pads act as a shock absorber. They absorb the impact of walking on your rug, reducing wear. Rug Pads also act as a barrier between your rug and your floor. This reduces the abrasion of dirt particles against the back of your rug. A Rug Pad will protect your floor. A Rug Pad protects your floor from grit and abrasion. The backings of many rugs can be abrasive. A Rug Pad will be a soft barrier against your floor. A pad can also help to absorb dirt, so the dirt does not scuff your floor. How big should my Rug Pad be? The Rug Pad should be a little smaller than the rug size. This will allow your rug to drape to the floor so you do not have a tripping hazard, and also covers your pad completely so you don't see the edges. Just give us your actual rug size, and we will cut the pad to fit your rug. Do I need to clean my Rug Pad? In general, no. You can vacuum it occasionally to remove grit. And you should blot any liquid spills until dry. Do some rugs need a particular type of pad? Yes. Braided rugs should have a non-slip pad, even if it is a large braid. The non-slip pad will hold the rows of stitching in place and extend the life of stitching on your braided rug. Braided rug manufacturers require the use of non-slip pads to validate warranties on stitching. What types of Rug Pads do you have? Felt Pad. 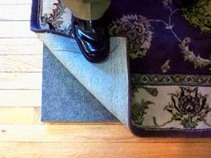 Felt pad is used under larger rugs that are not at risk of sliding. Felt will provide excellent body and cushion at a great price; and is suitable for fine oriental rugs. Our felt padding is a full 40 oz. quality, the best that's made. Some places cheapen the benefit of felt rug pad by selling, 32 oz, 28 oz, or even 16 oz. felt. Rug Saver Pad. Rug Saver pad is an excellent waffle type non-slip pad. Use this under smaller rugs to keep them from sliding. Rug Saver is low cost, but does not provide much cushion. Luxe-Hold Pad. Luxehold pad is a felt type pad on one side, and the other side is rubberized. Use with the rubber side down on hard surface floors. 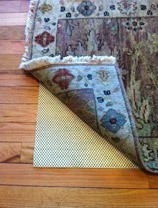 Or if you have a rug on top of a carpet, use with the rubber side up to help keep an area rug in place over a carpet. I have a felt pad. What side goes up? A common question. Felt pad usually has one side with a scrim or stiffer side. Put the stiffer side up. You will find it easier to position your rug on top. All Rights Reserved © Pelletier Rug Co. Inc.